It’s summer! 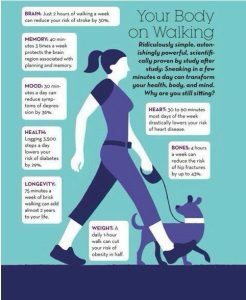 Get outside and play, walk, engage ~ stay active! First drink plenty of water. Our bodies are 60% water. Hydrate often ~ if you wait until you are thirsty it’s too late. Second engage in some form of physical activity daily ~ put down the electronics and move! Activity help us maintain a healthy weight, helps improve mood, decreases pain, improves flexibility, and cardiopulmonary and vascular health. Balance your activity and food intake. Third use safety measures ~ play it safe by wearing a helmet when bicycling, roller skating, or skate boarding. Wear proper fitting shoes with padded inserts. Walk in safe neighborhoods early when temperatures are lower or walk a mall in cooled air conditioning. Fourth use plenty of sunscreen and sunglasses to protect your skin and eyes. Reapply sunscreen frequently, approximately every two hours is recommended. Wear a hat, sunglasses, and bug spray for protection. Fifth eat nutritious foods! The new food pyramid focuses on 6 oz of Grains, 2 cups of Fruits and 2.5 cups Vegetables, 5.5 oz servings of Protein, 3 cups of Dairy, plus Physical Activity for 30 minutes for adults and 60 minutes for children each and every day. Sixty to 90 minutes of daily physical activity may be needed to prevent weight gain. Lastly enjoy the fresh air and just keep moving! We need sunlight and weight bearing activities for good bone heath, cardiovascular health, and muscle strength, endurance, power and mental wellbeing. Like US on FB: @ahnewphysicaltherapy. Concussions can occur in both young and old! Prevention is first and foremost! As summer is approaching we are outdoors more! Young children, tweens, and teens are most likely to have concussions from direct impact sports. Emergency room visits have skyrocketed! Older adults who fall are also at risk for concussion at the time of the fall and often go unnoticed! It’s important whatever the age, that we check out the individual and make sure that they have not had a concussion. What are some of the most common signs of concussion you ask? Drowsiness, blurred vision, unsteadiness with walking or balance, and/or headache. After a concussion it’s important to monitor the person for 24-hours to make sure that they do not have consequences such as going into a deep sleep or coma because of a more severe bleed inside the brain. For a few days and weeks after the concussion, we gradually recommend progressing back to activity and /or sport. Remove from play or activity and REST for the day ~ both cognitive and physical exertion. Seek medical help if symptoms worsen. You may need a CT or MRI. Medical and/or physical therapy if recovery is incomplete after 2-3 weeks. Up to 79% report dizziness and 56% experience balance impairment following a concussion. Baseline testing is highly recommended. If you want to learn more about concussions. please join us for our May workshop on “Concussion Health” on May 12, 2018 @ 10:00 am. RSVP 210-833-8336. Happy February everybody! Your heart may be the most important organ of your body! Your heart pumps blood and oxygen to all other organs of your body and your brain. Your heart is your vital organ for staying alive as without a heartbeat he will not be able to survive in this real world. So take good care of your heart! Aerobic activity most days of the week. No the signs and symptoms of a heart attack. Men and women differ in this area. Include breathing into your daily routine as slow deep Bress can fill your lungs with essential oxygen that then through our blood vessels flows to our essential organs and muscles. Take time to warm up before exercise or activities. This warm-up activity allows blood flow to your muscles and makes it less likely for you to be injured. Reach out and hug someone today! Your heart is essence of your being and can sustain and for fill your life for many years to come. TOP RECIPES FOR A HEALTHY HOLIDAY AND NEW YEAR! Do something you enjoy daily! Find a Friend to Workout with and Stay Active! Take a minute each day to walk, stretch, do yoga, Tai Chi, and just breathe! Eat a Nutritious Balanced Diet! Select your food wisely. Be aware of balancing your calories and also your energy expenditure. Eat earlier in the day. Take a walk after your large meal. Eat fruits and veggies, about 1gm of protein per kg of body weight (for example a 150# is 68 kg and needs 68 gm of protein or 1/2 cup), and add a sweet or two in for good measure. Cultivate your Spiritual Health and Wellbeing! Don’t forget to take some time just for you. To think. To Meditate. To pray. Happy Healthy Holiday and New Year! Tips if you have o steopenia and osteoporosis. 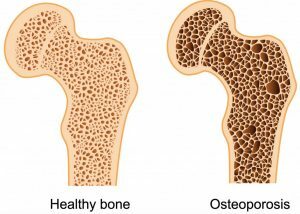 As we age, we lose bone mass and the quality of our bones decline, e.g. bone health. After the age of 30 our bone mineral density declines. Bone mineral density is measured by the amount of bone at your hip and at your lumbar spine by a special test called a DEXA scan (Dual-energy X-ray absorptiometry). Many times we have changes in our diet and nutrition that contribute to loss of bone health. Muscles contribute to pull on the bone and can actually enhance our billing mineral density. Lack of sufficient physical activity can lead to loss of muscle strength, power, and endurance. Muscle mass can be regained through physical activity and exercise through and beyond age 90. Muscle health is important to prevent fall. Falls may lead to a fracture if somebody has osteoporosis or osteopenia. Weight-bearing activities and exercises are recommended to minimize loss of bone. Osteopenia and osteoporosis can be minimized through nutrition and physical activity and individualized exercise prescription. Please contact your PCP and/or physical therapist today to minimize your risk and maximize your healthy and active function for Quality of life. Health check up yearly is important to make sure we keep tabs on our bodies! Early detection of disease or bone loss can minimize our losses in the long run.